Testimony: The Life and Work of David Friedman explores one artist’s experience with genocide. Miriam Friedman Morris grew up surrounded by her father’s artwork, but many pieces were missing and the work that was most important to him was the work he did not discuss. Born in Austria in 1893, David Friedman moved to Berlin in 1911 to study art. He began publicly exhibiting his works in 1919, and his paintings and portraits were published in newspapers and journals. However, most of this work was confiscated or destroyed when he, his wife and their infant daughter escaped from Nazi Germany to Prague in 1938, and still more was lost in 1941 when the occupying German forces deported his family from Czechoslovakia to Poland’s Łódź Ghetto. 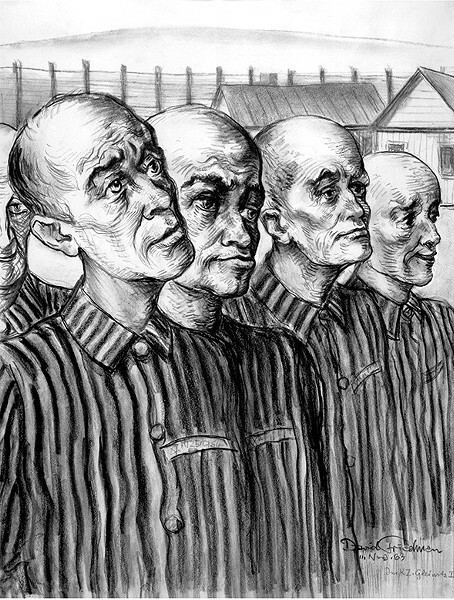 The sketches he made of life there were also confiscated and destroyed, and when the ghetto was evacuated, he was separated from his wife and daughter (neither of whom would survive) and sent to the Auschwitz-Birkenau concentration camp. 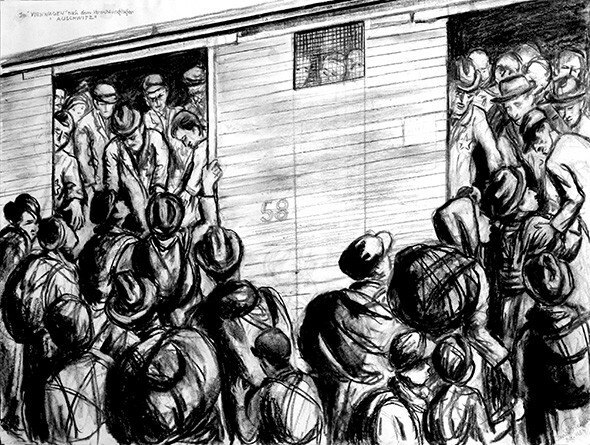 There — and in the Gleiwitz I labor camp and on a death march to Blechhammer — Friedman saw unspeakable horrors with his artist’s eyes that he began to depict after the Russian army liberated him in 1945. He continued his lifelong work after marrying fellow Holocaust survivor Hildegard Taussig and moving with their daughter Miriam to the United States. Testimony: The Life and Work of David Friedman is on exhibit through May 26 at Fred Jones Jr. Museum of Art at the University of Oklahoma, 555 Elm Ave., in Norman. The exhibition includes some of the artist’s portraits and landscapes along with Because They Were Jews, a visual diary of his Holocaust experiences featuring vivid illustrations with brief text descriptions. Though Morris remembers watching Friedman work on these and other drawings in his studio when she was a child, the scenes they depict were never a topic of conversation. After Friedman died in 1980, Morris discovered many of the unspoken details of his life by reading his diary. Using information from Friedman’s diary and with the help of art historians and collectors, Morris recovered many of her father’s pre-war artworks on several trips to Berlin, including hundreds of portraits he had drawn for German newspapers. 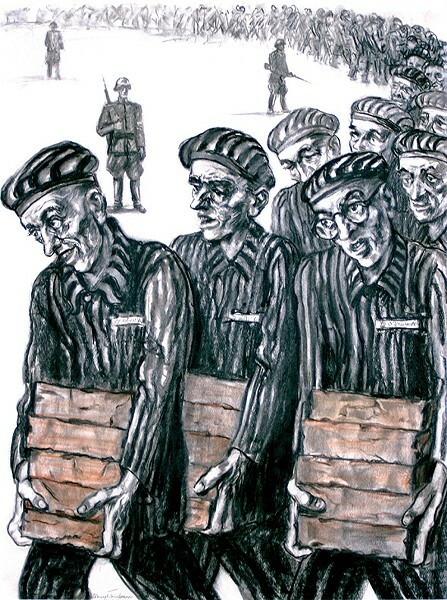 David Friedman’s “Prisoners Carrying Bricks” depicts the artist as the prisoner with glasses. Morris will discuss her father’s life and art at A Night of Testimony 7-9 p.m. April 18 at the museum. 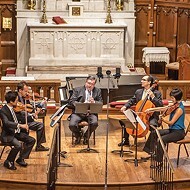 Lorne Richstone, associate professor of music at the university, will lead an ensemble in a performance of five excerpts from works by Jewish composers whose careers were lost in the Holocaust. The exhibit and the presentation are free. 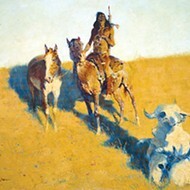 Call 405-325-3272 or visit ou.edu/fjjma.